The Presidents are in residence starting Saturday, February 16 at the New-York Historical Society’s DiMenna Children’s History Museum, a new museum-within-a-museum. Families explore, learn, and compete together with Presidents’ Day-themed programs, including scavenger hunts, an Abraham Lincoln quiz, chocolate-making from the colonial era, storytelling, writing workshops, and more, taking place through Tuesday, February 19. Ages 6 and up; Free with Museum admission. Families will search high and low throughout the galleries for presidential objects in this scavenger hunt. These hunts combine clues, images, and facts that help you locate these amazing president-related pieces. Scavenger hunts can be picked up any time in the DiMenna Children’s History Museum on the Lower Level. Ages 7 and up; Free with Museum admission. Who in your family knows the most about Abraham Lincoln? 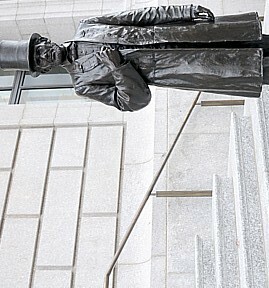 Test your knowledge about Honest Abe with multiple choice questions for kids and adults. As each question pops up on our big screen, families confer and write down their best guess. Each answer also highlights an object from the New-York Historical Society’s collection, so participants learn as they compete! A grand prize will be awarded to the family (or families) with the most correct answers, but every contestant receives a prize for participation as well. Ages 4 and up; Free with Museum admission. Vote for me! Choose a slogan and create an election button to wear home. Or create a funny-faced president by shuffling up some New-York Historical Society portraits. Drop-in throughout the afternoon and create the project of your choice! When Mrs. Madoff’s class decides to hold an assembly about Presidents’ Day, everyone in class helps set up and perform a grand play. Families are invited to a reading of Presidents’ Day by Anne Rockwell to discover why we celebrate the holiday. Then, kids can re-enact George Washington’s Oath of Office in the DiMenna Children’s History Museum! All Ages; Free with Museum admission. Chocolate was not always sold as a candy bar! See, smell, and taste colonial hot chocolate — watch as American Heritage Chocolate® educators grinds cocoa beans, add spices like red pepper, nutmeg, and cinnamon, and heat up hot chocolate to taste. Recommended for ages 10 and up; Payment required ($395). Spend your Presidents’ Day holiday in a special workshop taking advantage of the incredible stories from the WWII era. In collaboration with Writopia Lab, writing and history educators will lead age-based groups through this fascinating time period and exhibition, inspiring their short fiction, poetry and other forms of writing. Each day will combine time in the galleries, up close investigation of objects and documents, and time writing and critiquing. The DiMenna Children’s History Museum is a new museum-within-a-museum and occupies the New-York Historical Society’s entire lower level. It covers 350 years of New York and American history and includes character-based pavilions, interactive exhibits and digital games, and the Barbara K. Lipman Children’s History Library. Families explore and learn together, through visiting the museum and through participating in our intergenerational family learning programs. All ages can enjoy and learn in the DiMenna Children’s History Museum, but the exhibits are targeted at age 8-13. New-York Historical Society is recognized for engaging the public with deeply researched and far-ranging exhibitions, such as Alexander Hamilton: The Man Who Made Modern America; Slavery in New York; Nature and the American Vision: The Hudson River School at the New-York Historical Society; Grant and Lee in War and Peace; and the 2009 exhibition Lincoln and New York. Supporting these exhibitions and related educational programs is one of the world’s greatest collections of historical artifacts, works of American art, and other materials documenting the history of the United States and New York. From October 5, 2012 through May 27, 2013, New-York Historical Society is presenting WWII & NYC, a major new exhibition on the most widespread, destructive, and consequential conflict in history. WWII & NYC restores to memory New York’s crucial and multifaceted role in winning the war, and commemorates the 900,000 New Yorkers who served in the military while also exploring the many ways in which those who remained on the home front contributed to the national war effort. Museum Admission is Adults/$15, Teachers and Seniors/$12, Students/$10, Children (5-13)/$5, Children (4 and under)/free. The New-York Historical Society, 170 Central Park West, New York, NY 10024, (212) 873-3400, www.nyhistory.org.